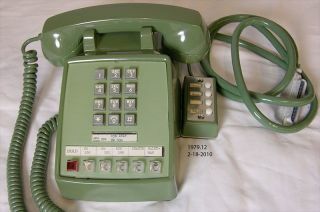 On July 20, 1969, President Richard M. Nixon used this olive green telephone to talk to the first astronauts on the moon. The same phone is now on display at the National Archives in Washington, D.C. The telephone that was used to place the historic first Earth-to-moon long distance call is now on public display at the National Archives, along with other spaceflight artifacts related to Richard Nixon's presidency. "Nixon and the U.S. Space Program" opened on Monday (Jan. 7) within the "Public Vaults" exhibit in the National Archives Building in Washington. The archivist of the United States David Ferriero and Jim Gardner, executive of legislative archives, presidential libraries, and museum services, oversaw a ribbon cutting for the mini-exhibit. Although it was President John F. Kennedy who set the nation on the course to the moon, it was Nixon who was in office during the first manned lunar landing that fulfilled JFK's challenge. On the evening of July 20, 1969, shortly before midnight (EST), Nixon picked up the receiver of the olive green phone in the Oval Office and called the moon. "This certainly has to be the most historic telephone call ever made," Nixon told Neil Armstrong and Buzz Aldrin as they stood at Tranquility Base. "For every American, this has to be the proudest day of our lives. And for people all over the world, I am sure they too join with Americans in recognizing what an immense feat this is." "For one priceless moment in the whole history of man, all the people on this Earth are truly one: one in their pride in what you have done, and one in our prayers that you will return safely to Earth," Nixon said. "It's a great honor and privilege for us to be here," Armstrong replied over his radio headset. "It's an honor for us to be able to participate here today." The telephone Nixon used to congratulate Armstrong and Aldrin is exhibited alongside the text of a speech he would have delivered had the lunar landing not been successful. The contingency statement, which was drafted by William Safire, was in case the Apollo 11 moonwalkers were killed or left to die on the moon. "Fate has ordained that the men who went to the moon to explore in peace will stay on the moon to rest in peace," reads the draft speech. "For every human being who looks up at the moon in the nights to come will know that there is some corner of another world that is forever mankind." The speech, which went unused, was revealed 30 years after Apollo 11 had returned safely to Earth. Nixon greeted Armstrong, Aldrin and their command module pilot Michael Collins on board the USS Hornet aircraft carrier after their safe splashdown in the Pacific Ocean on July 24, 1969. Five more crews landed safely on the lunar surface in the three years that followed Apollo 11. A pair of tongs used by Apollo 12 astronauts Charles Conrad and Alan Bean to collect moon rocks is also part of the "Nixon and the U.S. Space Program" exhibit. Under his presidency, Nixon saw an end to NASA's Apollo moon program in 1972 and the early development of the space shuttle. Nixon was also in office for the launch of Skylab, the United States' first space station, and its three crewed missions from 1973 to early 1974. Nixon resigned in August 1974, rather than face his impeachment for his involvement in the Watergate scandal. "Nixon and the U.S. Space Program" will be on exhibit at the National Archives through June 2013, when the small display will be changed to feature artifacts and documents from the administration of President Gerald Ford. The materials now on exhibit are on loan from the Richard Nixon Presidential Library and Museum in Yorba Linda, Calif., one of 13 presidential libraries administered by the National Archives.